MicroBiz is an inventory and retail management platform created specifically for retailers with brick-and-mortar stores. There are currently 25,000 retail stores and outlets that are now using MicroBiz to handle their inventory and retail management processes and workflows. In-store and online inventory are synced in one location, providing retailers with the most accurate inventory visibility possible. MicroBiz POS offers integration with leading e-commerce platforms including Magento. MicroBiz offers unique settings and features that are created for particular retailers, such as pet stores, sporting goods stores, and clothing boutiques to name a few. The platform operates in tandem with over 15 payment processors, improving the facilitation of credit and debit transactions while providing extra layers of security. MicroBiz POS bolsters store operations, both front end and backend, with a host of features demanded by multi-store, multi-channel retailers. The system uses the open API of Magento to provide a smooth retail store operations/e-commerce management system. The screen layouts and search functions in MicroBiz and Magento look and operate like each other, the product and customer records come with the same attributes, and the back office management tools complement each other. With MicroBiz POS, users can view the available stock of an item across all their stores from a single screen. This allows businesses to sell items that are available at other stores or perform and complete online sales regardless of your location. As the system is a true cloud-based software, MicroBiz users can get all the benefits of a true cloud-based solution. The advantages include continual offsite backups, immediate software updates, and ability to access your application anywhere and anytime. Users no longer need to manually enter product, customer, inventory, pricing, and sales data between systems – all information stored and processed in the system are synced automatically in all devices.. Versatility is another important MicroBiz POS feature. The system is compatible with any device that you choose – iPad, Mac, Windows. With a web browser and a reliable internet connection, you have everything you need to run your enterprise. With MicroBiz multi-language support, users can configure the messages on printed receipts and emailed receipts to the language of their choice. Along with the system’s multi-currency functionality, users have the option to display a functional currency for all of their store’s receipts and POS screens. MicroBiz Cloud more than an iPad-based point of sale system. It has been developed to automate the operations of independent retailers. 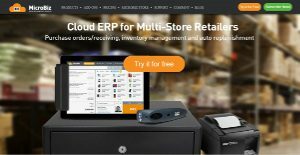 The app is an easy-to-use retail management software designed to automate manual tasks that can consume operations at independent retailers. It runs on iPads, Macs, and PCs and allows users to access their store system any time, any place. Updates are included for free with subscription. Some of the key benefits include:. What Problems Will MicroBiz Solve? 1) Managing Inventory between In-store Sales and Online Sales – Smaller retailers struggle to maintain inventory between their store(s) and ecommerce operations. Often this results in selling items online that are no longer in stock, requirement to manually enter items in both systems, and manual reconciliation of sales between systems. MicroBiz solves these issues with its Magento POS plug-in. This extension syncs products, customers, inventory, and images between POS and ecommerce systems automatically – so that retailers do not need to maintain two separate systems. 2) Creating Targeted Customer Lists for Email Marketing – It can be challenging for retailers to create targeted marketing campaigns. MicroBiz allows retailers to create targeted marketing lists through a variety of sorts and filters – such as last purchase date, birth date, vendor item, department, etc. The lists can be exported for use with popular email marketing apps such as MailChimp and Constant contact. 3) Selling to Different Types of Customers – Retailers often want to sell items at different prices to different types of customers (wholesale vs retail, students, loyal customers, etc. MicroBiz allows retailers to offer special pricing by customer type. Pricing can be based on $ or % discount off retail price, $ or % mark-up over cost or special price. The price adjusts automatically when the item is added to the register. Since each enterprise has unique business requirements, it is advisable for them to desist from seeking a one-size-fits-all faultless software solution. Needless to say, it would be futile to try to find such an app even among widely used software solutions. The intelligent thing to do would be to catalog the various important factors that require consideration such as key features, budget, skill levels of workers, company size etc. Then, you should do your groundwork thoroughly. Read some MicroBiz reviews and check out each of the other apps in your shortlist in detail. Such in-depth groundwork can make sure you discard ill-fitting applications and zero in on the solution that presents all the elements you need for business success. How Much Does MicroBiz Cost? We realize that when you make a decision to buy Inventory Management Software it’s important not only to see how experts evaluate it in their reviews, but also to find out if the real people and companies that buy it are actually satisfied with the product. That’s why we’ve created our behavior-based Customer Satisfaction Algorithm™ that gathers customer reviews, comments and MicroBiz reviews across a wide range of social media sites. The data is then presented in an easy to digest form showing how many people had positive and negative experience with MicroBiz. With that information at hand you should be equipped to make an informed buying decision that you won’t regret. What are MicroBiz pricing details? What integrations are available for MicroBiz? Pros: Integrated inventory, ability to have access to numerous reports, able to track cost of items (I was not able to with Shopify), and easy to use. Integrated inventory, ability to have access to numerous reports, able to track cost of items (I was not able to with Shopify), and easy to use. If you need more information about MicroBiz or you simply have a question let us know what you need and we’ll forward your request directly to the vendor.